Fish Dissections, Testing Polycom, Power Plant Tour & Swing Dancing Lessons! This morning I helped in the lab, labeling vials for the tissue collection for Lisa. Bruce and Jody did the second temperature tolerance test today. The temperature tolerance experiments are on the C. rastrospinosus icefish and consist of starting them with a water temperature of 0.8 degrees Celsius and ramping it slowly with a monitored flow meter going through a heater and back into the test tank. Three fish are the study subjects in each trial. The red-blooded fish, N. coriiceps, will be compared to the icefish in these experiments. The temperature is raised approximately 2.5 ºC per hour. The fish are monitored for behavior and the critical maximum temperature (temperature of expiration). The approximate CT Max was 12-13 ºC. After they go "tail up" and loose equilibrium, they are anesthetized for several minutes in a solution and brought into the lab for tissue collection. The tissues collected will be used by the scientists for a multitude of tests, the majority of which are for collecting data on the effect to the oxidation in the mitochondria from the increase in temperature and to determine if they can increase expression of genes required to protect them against heat stress. Because the fish do not have hemoglobin to transport oxygen, this species appears to be more directly impacted by temperature increase (higher water temperatures hold less oxygen) and ability to utilize oxygen. The tissues taken are from the heart, liver, kidney, retina, white muscle and pectoral muscle, weighed, inserted in small vials and flash frozen in liquid nitrogen. I have been assisting with record taking during the dissections by Bruce and Jody. They are extremely adept with the tissue removal and it goes by quite quickly! After we completed the dissections for the day, Jeff Otten (IT Specialist at Palmer Station) helped me set up and test the Polycom system that will be used to contact my school on Friday for a videoconference. I will be able to see them and they will be able to see me via satellite transmission! It is such an incredible system. Mr. McRae from my school has helped to get it working on the school's Access Lab and Mrs. Stephany Hannon (Marine Science Teacher) and Mrs. Anna Hardy (English Teacher) also joined in to see me. It was such a fun experience and I cannot wait to get to see the students and answer some science questions on Friday! A question that always seems to arise and one that I had before coming to Palmer Station was "what is the power source?" Ken Keenan, Station Director, set up a "power plant tour" with Will Watkins to get my answer! After lunch, I set off up the hill to the building known as "GWR" (Garage, Warehouse & Recreation - creative acronym, huh?). We put on the ear muffs to block out the incredible noise of the engines, and Will showed me the power plant, which consists of a room housing two large generators with CAT Diesel Engines. So the entire station's power is from diesel fuel. Will estimated the weekly use at 1,600-1,700 gallons of fuel for the entire station - labs, living areas, kitchen, offices, everything! Impressive! There are several holding tanks for the fuel and the heat put out by the generators is actually used to heat the entire GWR building. Amazing! He also described how one generator runs at a time for three weeks, while the other is serviced to ensure proper function of both. 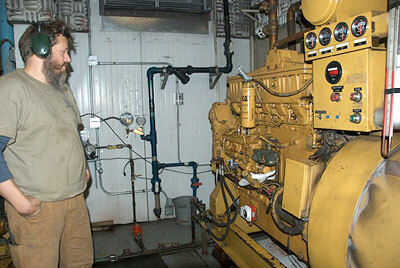 There is also a back up generator that would allow the Bio building to operate. The fuel is re-supplied with the ships that come from Punta Arenas, Chile. Question answered! After dinner, Irina and Ryan gave some swing dance lessons for some entertainment. Boy, was it entertaining! Irina has been taking lessons for a couple of years and Ryan has been instructing for a few years. They were both fun to watch because they were such pros and very good instructors! The rest of us made honest attempts and had a lot of fun in the process! It has been many years since I have actually done swing dancing and too many years to count since I was an assistant instructor in high school for 7th grade ballroom dancers! Needless to say, it was a great activity to end another fun-filled day at Palmer!